The Light We Lost by Jill Santopolo is one of those books that I took with me – in hardcover – to walk the dog. That’s how involved I got in it. Lucy and Gabriel meet on 9/11, when they are in an English seminar together during college. They share an intense moment from the roof of Gabe’s building as they watch lower Manhattan burn, an experience that will always bond them. There is the promise of a romantic relationship, but Gabe gets back together with an ex-girlfriend and they go their separate ways. A few years later, they meet up in a bar on Lucy’s birthday, and end up getting together for good. This is the first serious, adult relationship for both of them, and Lucy moves in with Gabe after a few months. They are very happy together, even though Gabe, a photographer, is hinting at a desire to go abroad to capture conflict zones. Lucy is crushed when Gabe takes a job in Iraq, leaving her alone in Manhattan and walking away from their relationship. A few months later, Lucy meets Darren, an investment banker who is older and more settled, and she ends up marrying him. But while she is happy with Darren, Gabe is never out of her mind entirely. The Light We Lost is about Lucy’s regret and second-guessing, her continued relationship with Gabe, and what happens when Gabe comes back into her life more consistently a few years into her marriage. At first, I thought The Light We Lost was good, then I feared it was veering toward something more trite and juvenile, and then I got into it. Santopolo does a great job of conjuring those intense, 20-something relationships where the stakes feel enormous. Of course, time and perspective make those 20-something relationships seem a little, um, dramatic?… but it was fun to relive the intensity of that period for a little while. Were Lucy and Gabe really meant to be? Did they even know each other well enough to know for sure? Would their relationship have survived adult stressors like parenting and money and health problems? Who knows. But it was fun exploring the concept of a soul mate and lost loved and what we owe to others vs. our own happiness. 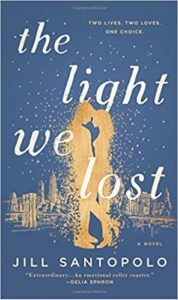 The Light We Lost is not a perfect book but I enjoyed it quite a bit. Posted on September 9, 2017 by gayle. This entry was posted in Fiction and tagged jill santopolo, the light we lost. Bookmark the permalink.